The practice of phlebotomy is essential to numerous clinical laboratory practices, and the drawing of blood by venipuncture for transfusion, apheresis, diagnostic testing, or experimental procedures is a decidedly human interaction. Thus, employing and retaining qualified phlebotomists should be an imperative of laboratory leadership and health care leadership in general. Foremost, phlebotomists serve as the public face of the laboratory. While most technical laboratory staff work behind the scenes, phlebotomists interact with patients directly as their primary function. And though the essence of the job is methodically obtaining blood from patients, phlebotomists may be tasked with numerous duties. At Excela Health, we employ almost 100 phlebotomists across the system and they are considered an essential component of our workforce, in addition to representing Excela to the community. Excela Health is a three hospital system in southwestern Pennsylvania, about 30 miles east of Pittsburgh. As the only hospital system in Westmoreland County, Excela Health competes with many other health care providers, including the large national reference labs. Thus, the system employs a robust outreach program featuring 21 patient service centers branded as QuikDraw. Further, we service 33 nursing homes, a juvenile detention center, a state mental hospital, and numerous in-home patients. To accommodate this broad patient population, the aforementioned team of phlebotomists is generally divided into Phlebotomist and Senior Phlebotomist positions. The latter perform registration in a variety of instances, including samples from the nursing homes, send-in specimens from physician offices and visiting nurses, as well as in the outpatient setting. This strong phlebotomy staff directly enables us to perform our work. In 2012, Excela Health experienced a significant amount of turnover, both voluntary and involuntary, among phlebotomy staff; we lost approximately 20% of our staff across the system, with the majority coming from the largest hospital campus. There were several reasons for this attrition (eg, pay, career advancement, scheduling concerns, job fulfillment), but as a system, this represented a significant shortage of skilled, patient-facing personnel. Although Excela Health partners with several professional phlebotomy programs at community colleges, trade schools, and vocational-technical schools, the need for additional skilled phlebotomists remained. In struggling to staff this vital role, we had to authorize crisis pay to maintain sufficient levels. At the same time, we had just opened a new large outpatient facility, which required staff to have customer service skills in order to be competitive in the outpatient market. Due to high demand, we were hiring staff based on their hard phlebotomy skills, but often had to terminate them due to a lack of soft skills (eg, customer service, attendance, etc). The idea of starting an in-house training program came from a displaced employee. This employee had been a nursing assistant, but due to the effects of a torn rotator cuff, she was unable to comfortably perform her nursing assistant duties, yet did not want to go on disability. Our employee health manager contacted me to see if we could train her to draw blood, and we were lucky to have a supervisor who had taught phlebotomy in the community college setting and had both the skill set and the desire to train. The displaced employee was retrained and became a skilled phlebotomist. Based on this experience, the seed of an in-house phlebotomy education program started to germinate. We began by developing a proposal to be presented to senior leadership for approval and involved the supervisor who taught our displaced employee as an instructor of both the didactic and clinical portions. 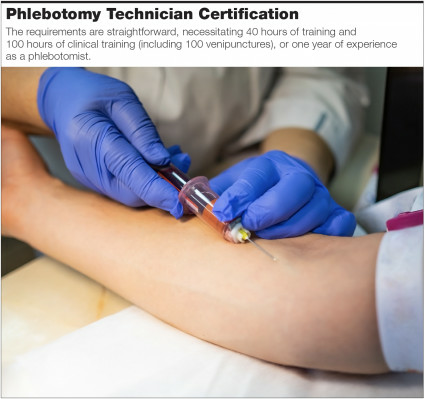 In order to develop this program, we reviewed the American Society of Clinical Pathologist (ASCP) requirements for the Phlebotomy Technician Certification exam: PBT(ASCP). The requirements are straightforward, necessitating 40 hours of training and 100 hours of clinical training (including 100 venipunctures), or one year of experience as a phlebotomist. With the exception of providing a textbook for the students,1 most other commodities were already available in the laboratory (ie, tubes, needles, gauze, etc). We did acquire a training arm to assist in developing the students’ phlebotomy skills. Finally, since these students would be employed by the health system, we had to pay them an hourly rate. 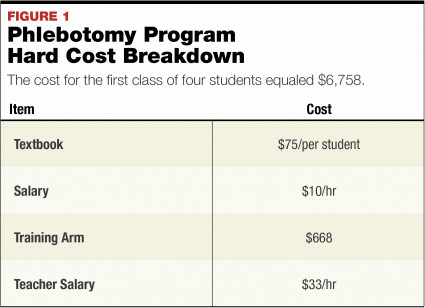 FIGURE 1 demonstrates the hard cost breakdown for the initial phlebotomy class consisting of 4 students. In researching professional phlebotomy programs in our geographic area we found tuition fees up to $1600 for a 12-week class. In our case, we did not charge the students anything for the program (and in fact paid them $10 per hour), but we did ask that they agree to stay atleast one year after the end of their instruction period as a full-time phlebotomist. With the help of human resources, we developed a contractual agreement with each student wherein the estimated cost for the program, per student, came to approximately $1,500, and this cost was pro-rated over the course of the subsequent year to be paid back if the student was unable to complete the year (see FIGURE 2). The last step before implementing the program was to develop the training schedule. Along with phlebotomy theory and venipuncture skills, we also sought to develop soft skills, such as customer service and telephone etiquette. In doing so, we invited leaders in those areas from the health system to present to our class. 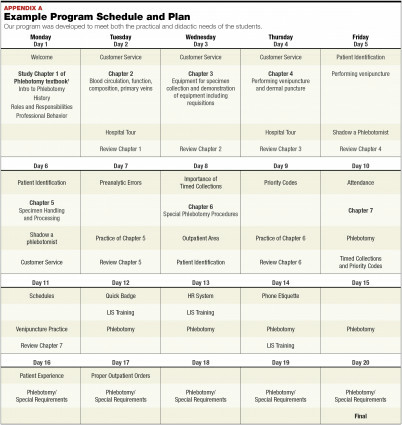 The program plan was designed to meet both the practical and didactic (classroom) needs of the students (see Appendix A). The goal of the program was to produce a fully trained and capable phlebotomist who would remain as an employee (barring unforeseen circumstance) for the next year, at least. The better we trained the student, the better off we would be with the eventual staff member, so the onus was on the program to produce quality results. With the program plan and curriculum mapped out and approved by administration, the next step was to find prospective students. To find the best candidates, we decided on a two-pronged interview process; first, candidates would be interviewed by a panel consisting of representatives from laboratory leadership, human resources, and customer service. Second, candidates were given a customer service pretest that had been developed in house for other patient-facing positions to target aptitude in this area. We interviewed several candidates, both internal to Excela Health and external. With the first class, we could only accept Excela Health employees working part time, as the classes were scheduled to run during regular working hours. After the interviews were complete, the first class was set with two internal candidates and two external candidates. Our first students completed the program with excellent performance and all four were employed with Excela Health. 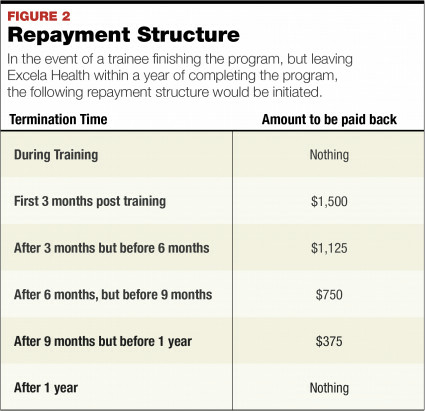 One student received a job offer from the local VA hospital and left prior to the first year, so he paid back a portion of the training fee per the agreement. Of the remaining three, one left Excela Health after one year to be stay-at-home parent and another left to work for the county 3 years after completing the program. The fourth member of the initial class has remained with Excela Health, eventually moving to work with the physician practices. This personnel information demonstrates the effect on turnover of an in-house program. Some factors cannot be planned for; nevertheless, we received good return on the investment. Since the initial class, we have matriculated five additional classes, from which several students are still employed at Excela Health. (Of note, we did not guarantee employment to the trainees after the initial class.) Subsequent to the initial group, classes were tailored around full-time hours to allow FTE employees to participate in the program. Due in large part to the success of our program, the demand for phlebotomists has fallen off and we no longer rely on crisis pay or overstressed workloads. As turnover has decreased substantially and the customer service skills of our phlebotomists has increased, we no longer have the need for a regularly scheduled training program. That said, we are retaining the structure and have utilized it for staff retraining exercises. Our implementation of an in-house phlebotomy program helped us to fill open positions during a crisis, but had the ongoing effect of fostering better soft skills while maintaining rigorous training in the hard skills of phlebotomy. As a direct result, we see fewer staff call-offs, customer service issues, and involuntary terminations. Given the vital nature of phlebotomy to the entire health care continuum, the time and effort spent on implementing an in-house training and retention program has been far outweighed by the benefits. Barbara Day, MS, MT(ASCP)SBB, is the system director of laboratories for Excela Health, located in Greensburg, Pennsylvania. She has worked in various laboratories and health systems throughout her 35 year career, which began as a phlebotomist.